The much anticipated launch of the Affordable Care Act, also known as Obamacare has finally arrived, and with it a shiny new website, www.healthcare.gov. The site launched this morning at midnight, yet it is already experiencing technical difficulties preventing users from applying for health coverage. The site makes you choose which state you are currently living in before you can apply, and depending on where you choose you could remain on the government site or be redirected to a third party site, specific to your state. We chose the state of Maryland first and were redirected to the Maryland Health Connection website, (www.marylandhealthconnection.gov) where we were told the site was experiencing connectivity issues and to return back to the page at noon today. Next we tried the Commonwealth of Pennsylvania as our state of residence and we remained on the the healthcare site, only to be told again that the system is down and that it was being worked on. We were told to try again later. If you are one of the millions of Americans currently living without health insurance you have likely been anxiously anticipating this day since President Obama announced the measure back in 2009. Unfortunately whether due to a massive flow of traffic to the site or to some other technical glitch you may have to wait a little longer before you can apply for the benefit. But hey, we've been waiting 4 years, what's a few more hours? With what regular Americans stand to gain from this historic piece of legislation we are willing to give the site's developers a pass on such an epic launch day fail. 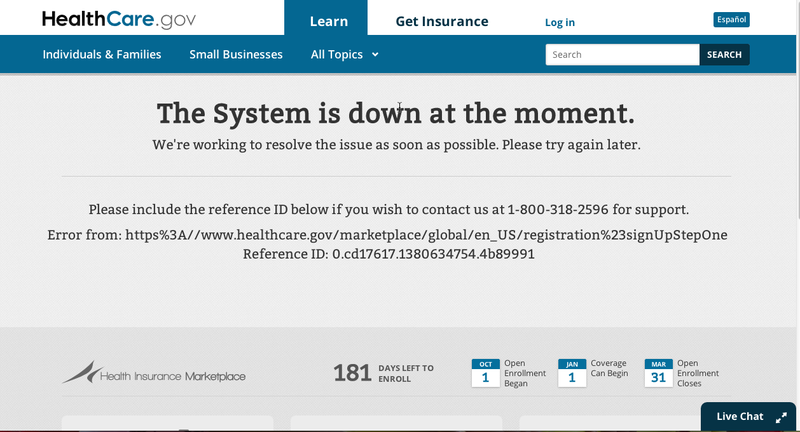 Have you been able to apply for Obamacare today? Which states have allowed you to apply in your experiences so far?